There’s always been something magical about things that glow in the dark. 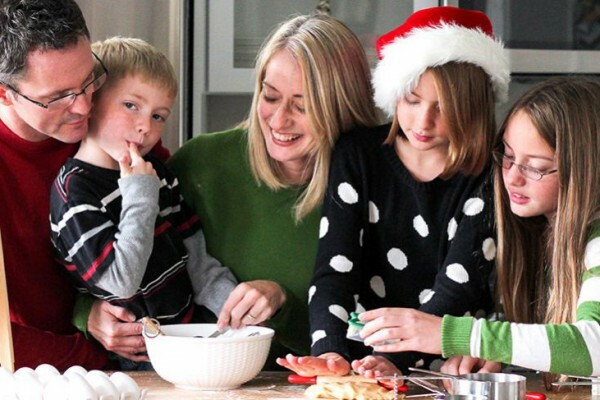 For generations, kids have been drawn to glowsticks, bracelets, stuff that lights up. It’s exciting, but also strangely comforting, like that childhood fear of the dark can’t hurt us anymore. Or maybe, amateur psychology aside, glow in the dark stuff is just plain cool. 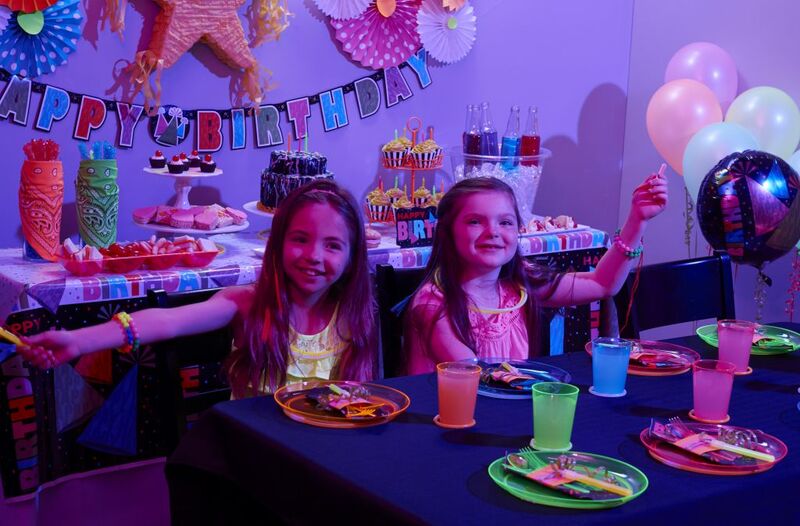 That’s probably the reason that one of the most popular themes for birthday parties is our Neon Glow in the Dark party. 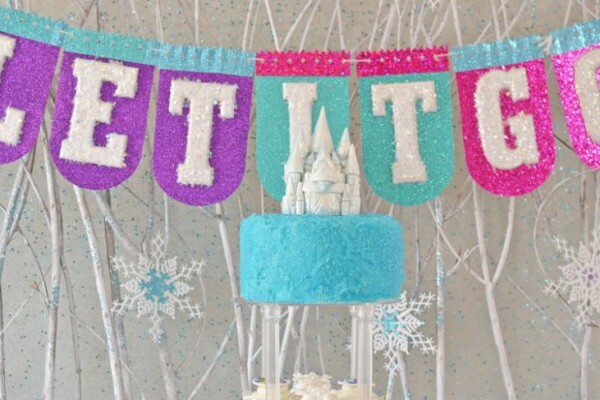 And we’re going to show you how to put together everything you need to make your child’s birthday party one that will surely shine bright. The key to our party design is that we replaced all the regular light bulbs with black lights. It made all of the colors pop, especially the glow in the dark items. 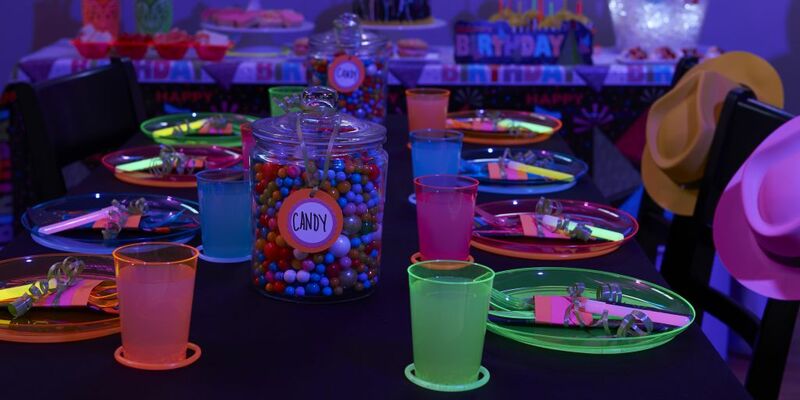 Plates, cups, and napkins both match the theme and stand out in the black light. 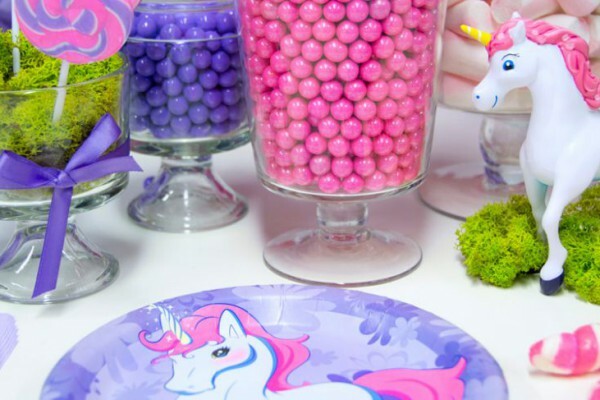 This awesome Neon Party Tablecover can be used on your dining table, or like we did, you can use it on your buffet table. 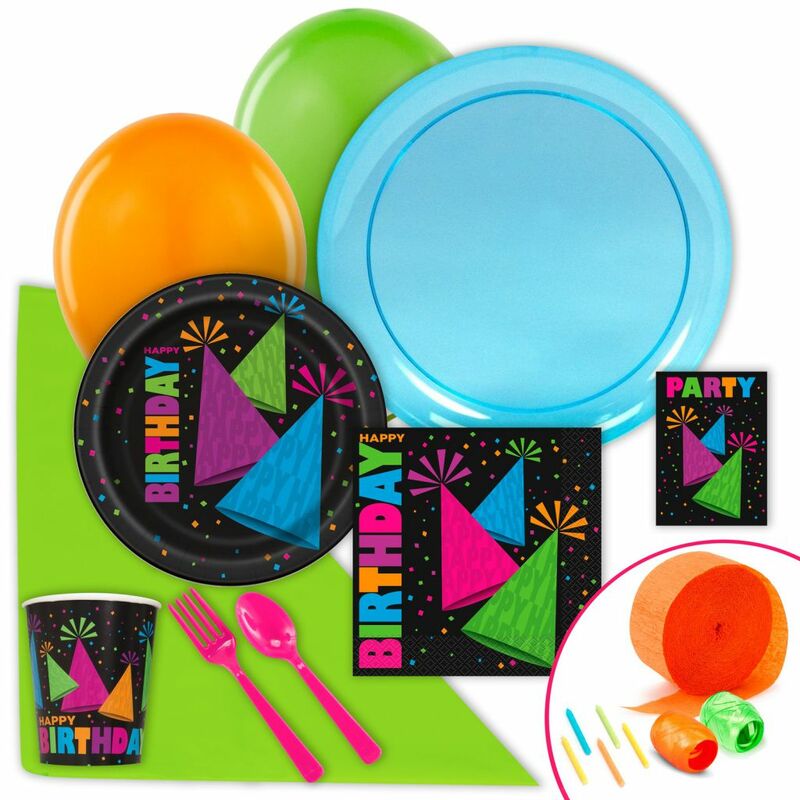 Get everything you see above in our Neon Glow in the Dark Party Pack! 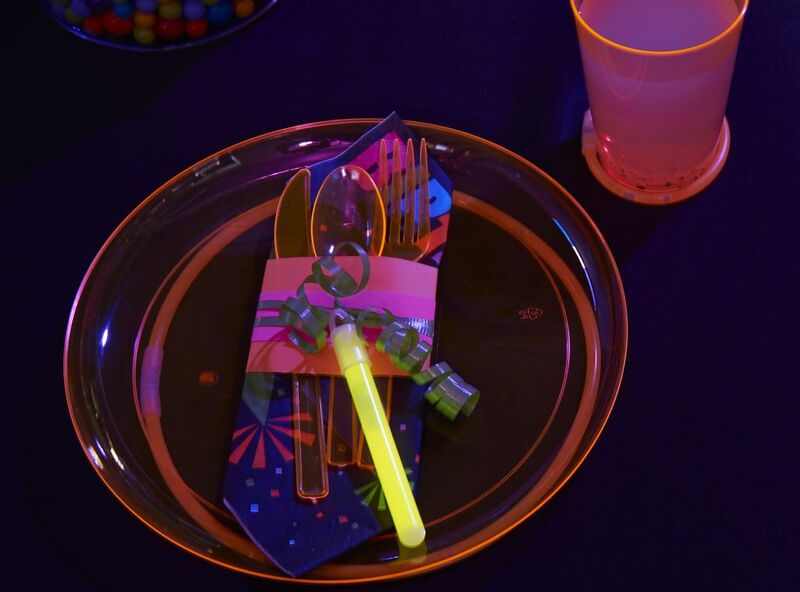 We have neon colored clear plastic plates, cups and silverware that look fantastic under black light. This cutlery packet was made by folding a napkin and securing it with a strip of scrapbook paper and some curling ribbon. Then we slipped in a fork, spoon and knife and attached a glowstick to the ribbon. 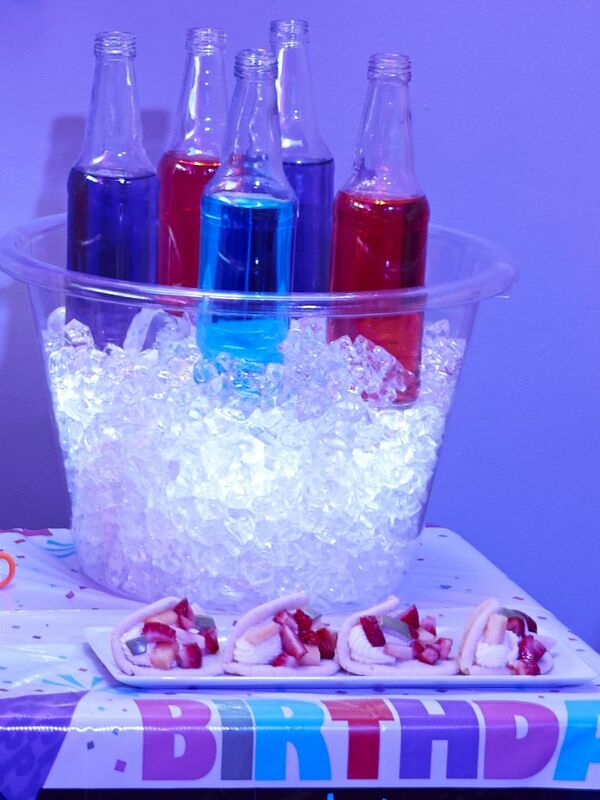 Fill the cups with lemonade and you can get even more glow-in-the-dark fun! 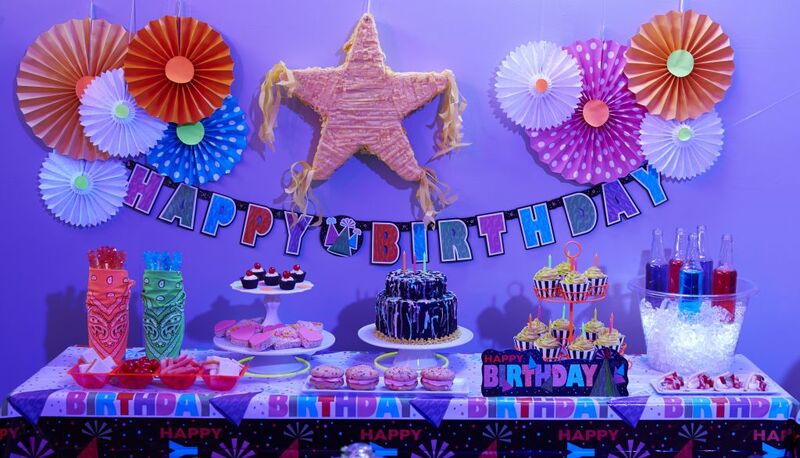 For our buffet table decoration scheme, we included a neon jointed birthday banner, a neon table centerpiece, as well as mixing in a solid color pinata and a paper fan decorating kit. 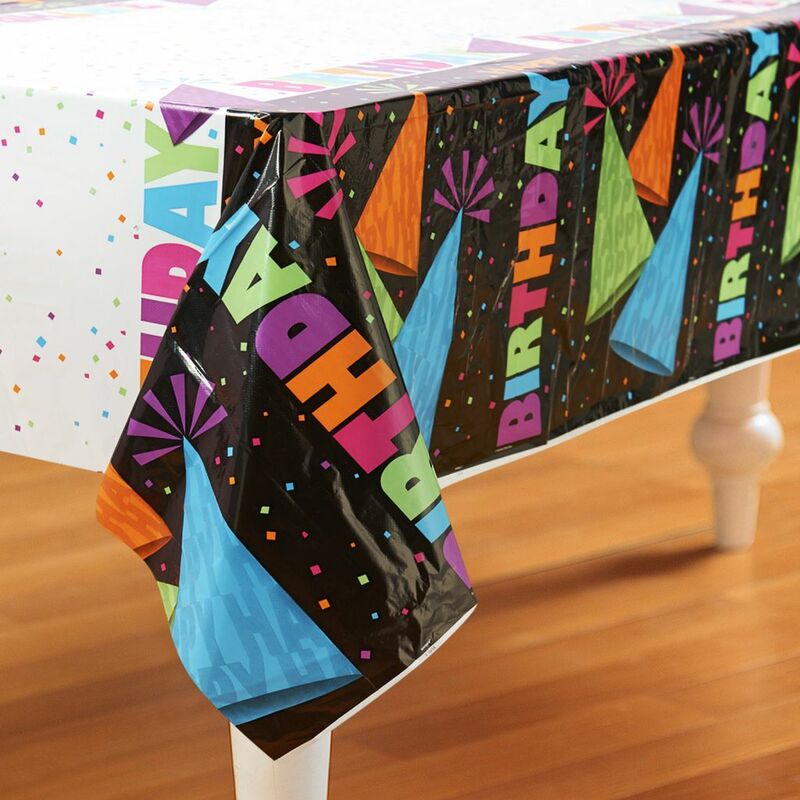 Find your own decorating additions in our huge selection at BirthdayExpress. On our food buffet table, we set out tasty treats like these mini-brownie-cupcakes, with whipped cream and a cherry on top, as well as some healthy snacks like a veggie tray. 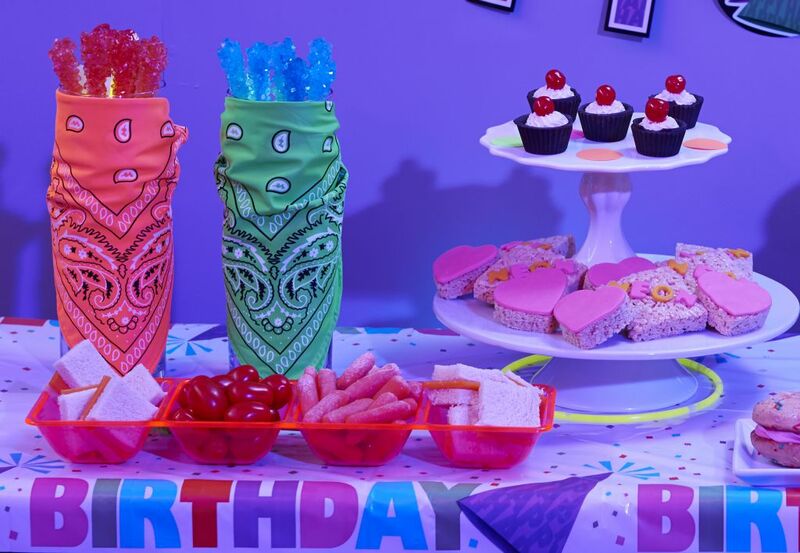 Neon colored bandanas were wrapped around vases containing rock candy sticks. 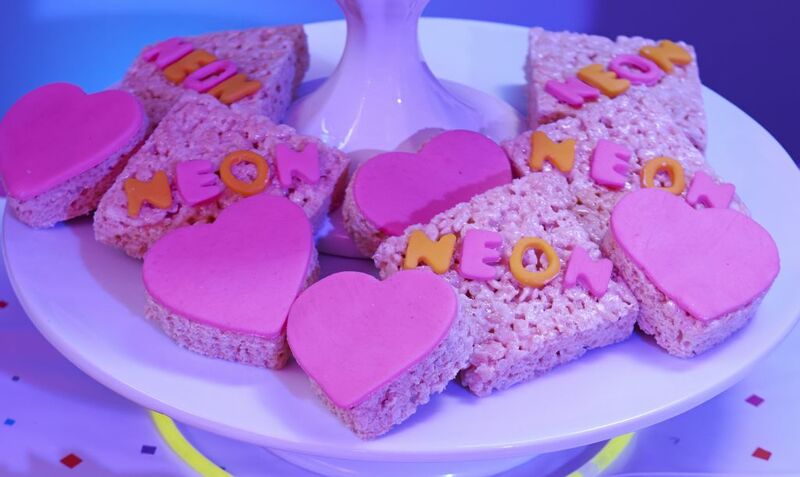 Here’s a close-up view of our Rice Krispies Treats, with fondant hearts and letters, cut out with a cookie cutter. But we’re not done! 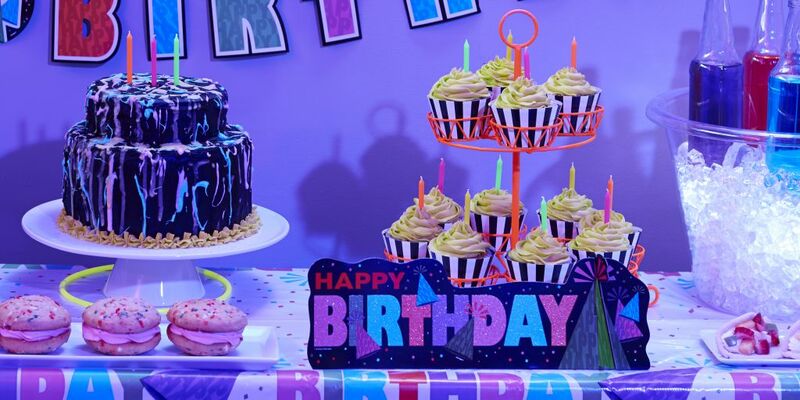 These vanilla cupcakes are store-bought, with yellow icing and neon candles, wrapped in our black & white striped cupcake liners, and we displayed them on a bright orange cupcake stand. 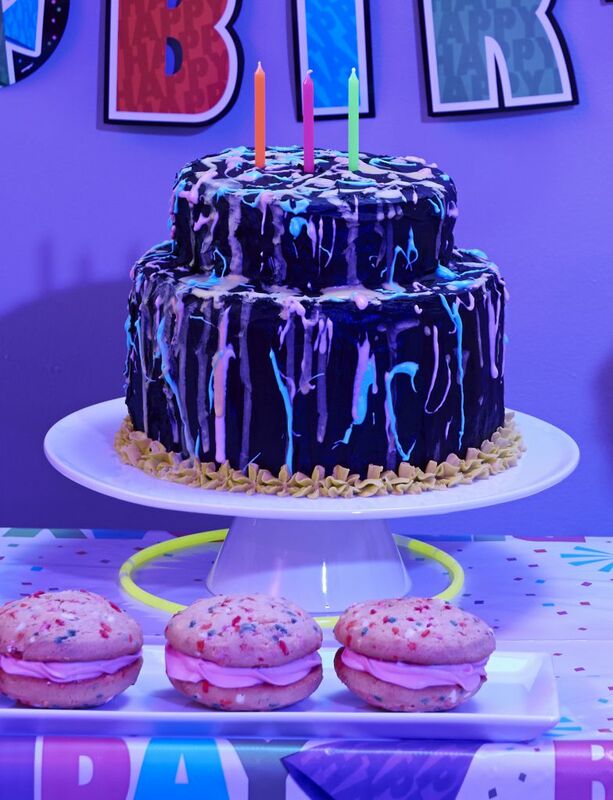 This chocolate frosted cake has been drizzled with two different colors of neon icing. As cool-looking as it is delicious! Those amazing frosting sandwich cookies are created using confetti cake mix to make “cake cookies,” then adding strawberry frosting in between. We washed out and recycled some old clear soda bottles and added different flavors of sports drink to make the colors of our beverages stand out against the background. Finally, we took pieces of mini-flatbread and added cream cheese and diced fruit to make a healthy snack. 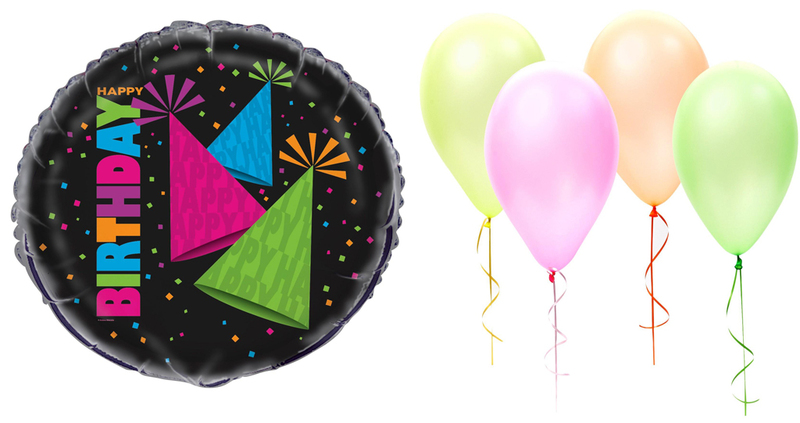 If you’re looking for balloons for your party, look no further than this great Glow in the Dark Party foil balloon, or these neon colored latex balloons. 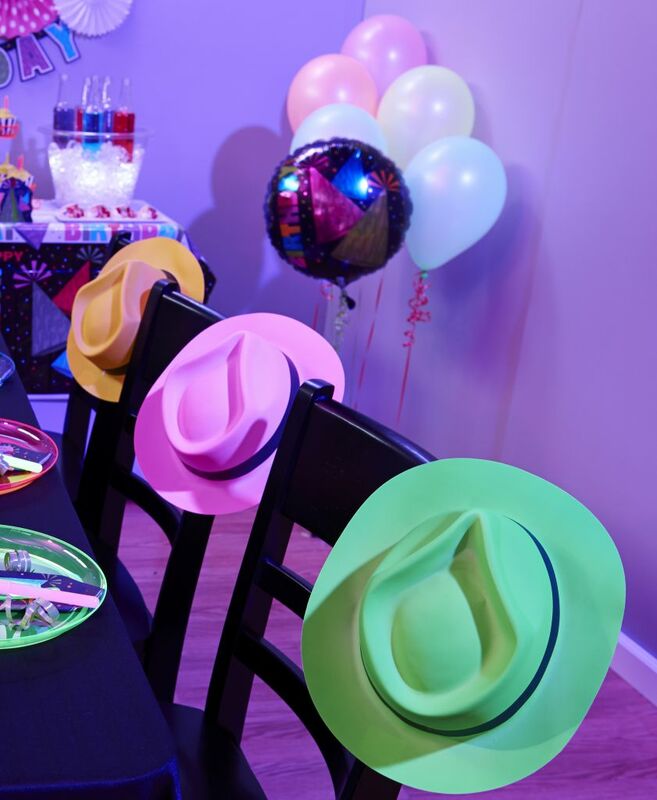 These neon fedoras are a lot more stylish than plain old paper cone party hats, and can double as favors that the guests can take home. 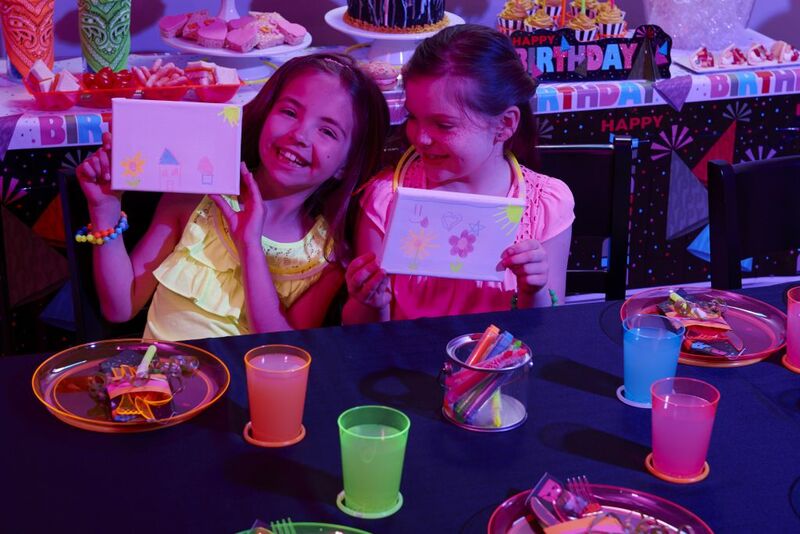 For a fun party activity, get canvases from the craft store, and let the guests draw a pretty picture with glow-in-the-dark paint pens. 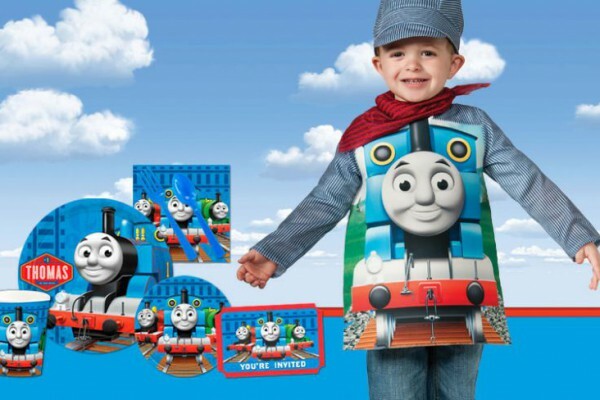 The possibilities are as limitless as their imaginations. When the party’s over, and the candles have been blown out, and the presents have been opened, send your guests home with these awesome pre-filled favor boxes. 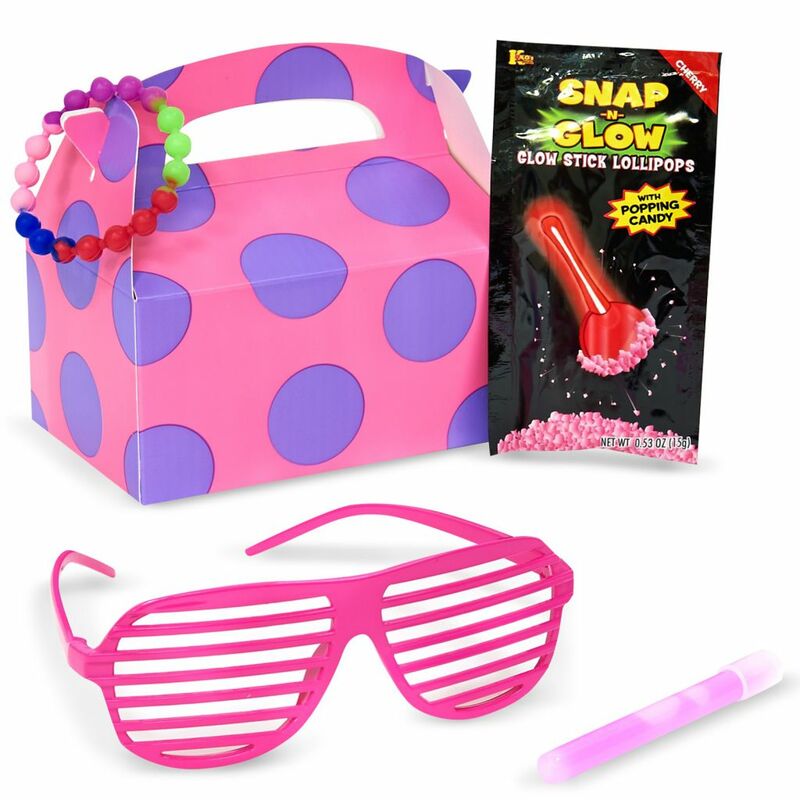 They come with a pair of neon shutter shades, a neon bracelet, a glow in the dark lollipop, and a glowstick. And who doesn’t love glowsticks? These two sure do! 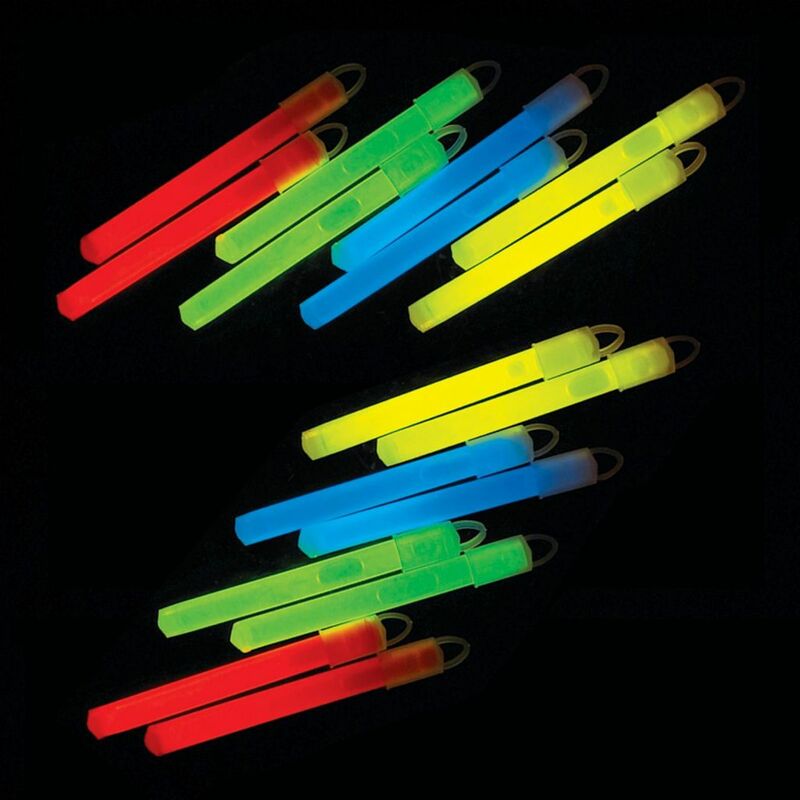 Click here to browse all of the Glow in the Dark products for your Neon party! 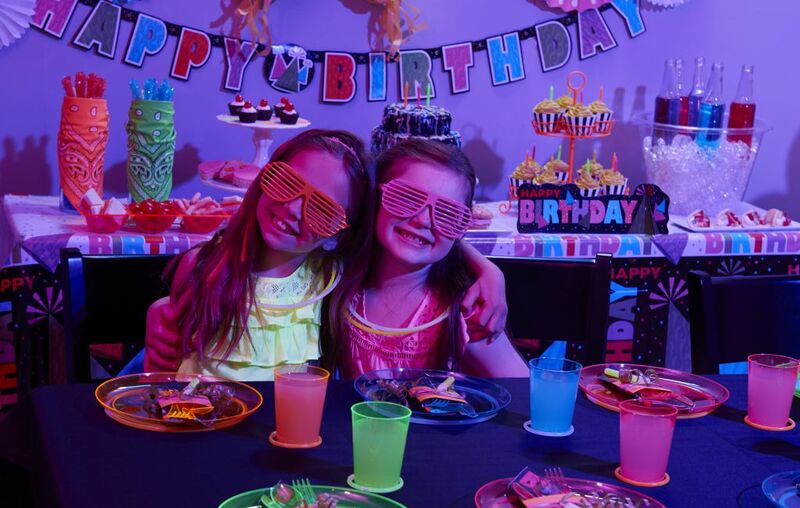 Have we inspired you to throw a Neon Glow in the Dark Party for your little shining star?